The Sirius is part of the Canis Major constellation. It is the brightest star of the nightly starry sky that has more power than the Sun. It is not moving in a straight track but follows a wavy line. Our boat Sirius is a Barkas, an eye-catching traditional ship that is built with a wink to the professional shipping. Because of its low height and smart techniques the ship lays extremely stable in the water. With a height of just 2.40 m. (without its mast) it is perfectly suited for the canals of Utrecht and Amsterdam! From our own experience we can tell you that there are lovely shipping routes which we would love to share with you before boarding. Next to the authentic Dutch canals The Sirius is also very much suited for the larger waters because of the submarine ship. 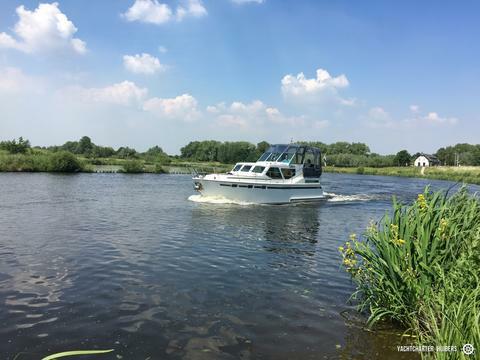 A versatile boat which you will surely enjoy your Dutch shipping holiday on! Once you enter the ship you can reach the ground floor lounge the open tub. Here you will find the steering position. Another advantage is the location of the powerful John Deere engine. Because its located under the open tub its always a quiet and calm experience in the lounge.